Two were the demo cars displayed at the Elettromedia Showroom: one for Hertz, a Fiat 500 equipped with the brand new Dieci DSK 165.3 system and the EBX F20.5 flat sub box, amplified by a Hertz HDP 4; it also featured the Audison bit Ten which had the task to take and elaborate the factory head unit optimizing it for enhanced performance. The installation was made by the specialty store „Traffic Jams“ (California, USA). 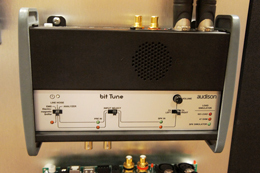 Regarding Audison a VW Golf GTI was displayed, featuring a Full Digital Audio 24bit/96kHz system supported by the Audison Voce products and managed by an Audison bit One processor; the whole project was developed by the specialty store „Mobile Solutions of Calgary“ (Alberta, Canada).